The hip, organic, breathable, pebbly, mattress. 1. Buy something that is not too heavy, so that it is light enough to lift each time you have to change the sheets after there is an accident. 2. Buy something that is easy to clean, again because of the accidents. 3. Buy an organic mattress. Since infants spend most of their time sleeping, it’s worthwhile to consider investing in an organic mattress to ensure there are no issues of toxic off-gassing and if possible also try and get a mattress that is breathable, to ensure the baby gets a good air flow in their sleeping area. Finally after doing a lot of online research and several trips to the store, we discovered the Nook Sleep Systems Pebble Mattress to be a pretty cool mattress option. Nook Sleep Systems is dedicated to innovation. They look at the entirety of the mattress to develop a cohesive holistic design. They have taken the time to make sure that their mattress is well designed, breathable, non-toxic and completely organic. The internal core of the mattress is made of natural latex which is an open celled material that maximizes air flow through the core (for breathability which will allow more oxygen to the baby, meaning a better night of sleep) and the natural latex is hypoallergenic, anti-microbial and anti-mites (no nasty bed bugs!). The inner core is wrapped with organic wool which is a natural fire barrier as opposed to the harsh chemicals used in standard mattresses. 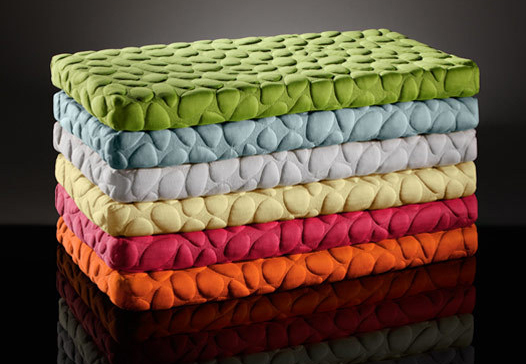 The surface is made up of eucalyptus fibers and cotton to help remove moisture and promote breathability, and the best part is that no vinyl mattress pads are required since liquids will bead on the surface of the mattress, and they come in cool bright colors as well! Nook Sleep System products are Made in North America (this time it’s for real, on manufacturer’s website!) and they even offer twin size mattresses. Hopefully, they’ll expand their line to include double, queen and king size for us adults to enjoy as well. We are members of Zulily (an online designer discount store) and they had the Pebble Mattress on sale for half the price so we jumped to make the purchase. It’s quite an expensive mattress so if you are looking at purchasing it, we strongly recommend to see if you can find a great deal online.